AirMedia is a feature available in Otis Smart Classrooms. Students can wirelessly share content from their devices to the classroom projector. Mobile devices (smartphones + tablets) can share photographs and documents. Laptops can share any type of file on the desktop though you may need to download a separate application (Soundflower) for sound. Faculty need to select the "AirMedia" option from the touchscreen control panel FIRST. Specific instructions will be projected explaining how students can connect to the classroom AirMedia. The WiFi password will be displayed on the projected instructions. Laptops > Type the in the IP address or full Http address listed on projected directions. 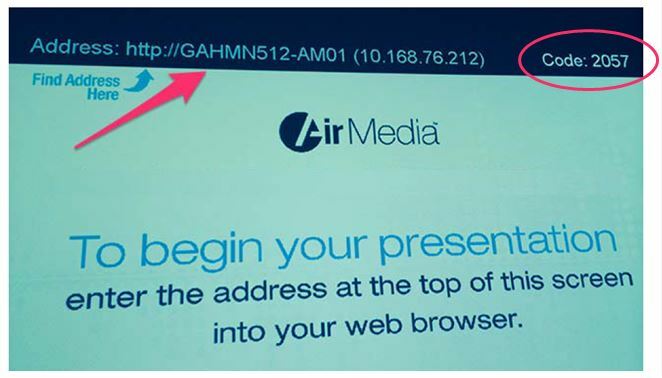 Select the AirMedia IP Address for the classroom you are in. Enter the unique CODE as it appears on the classroom projected instructions. Select to share media to projector.